Let’s take a look at some ways of comparing English. While you’re here, check out Money Vocabulary: 42 Words to Talk About Money in English. OK. Let’s play that world-famous game, Compare the Circles. What? You don’t know it? First of all, can you compare these circles? OK — what about these circles? Did you say, “Circle A is bigger than circle B,” again? OK. You’re correct, but there are lots of other, more interesting ways to compare things in English. 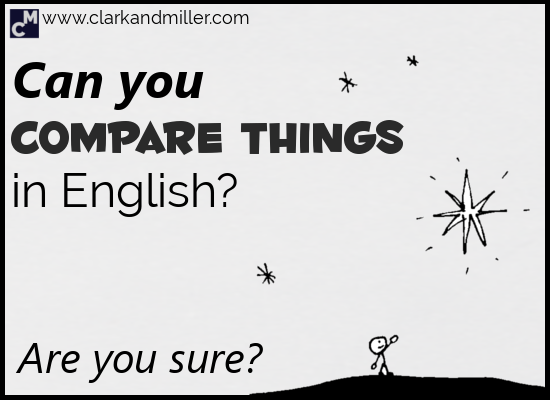 Remember when you first learned how to compare things in English? I’m guessing you probably learned to compare things using adjectives — talking about how Moscow is bigger than London, for example. Or how pasta is tastier than salad. And why not? Adjectives are probably the most common way we compare things. Click here for a text version of the image above. Nowhere near as fast as Larry. Not as fast as Larry. Not quite as fast as Larry. Just as fast as Larry. Comparing things doesn’t stop at adjectives! Sometimes we want to compare the different ways people do things. He speaks even more quickly. She speaks the most quickly. When we want to compare two (or more) things, we usually use adjectives. But sometimes, the adjective just isn’t quite enough. Sometimes what you want to say can be better expressed with a noun. Remember, we can’t use just any noun. For example, you can’t say that your table is more of a table than my table. Also — comparing tables like that is strange. But there are some nouns that have a feeling of opinion about them. Mr Derek is not as much of a genius as Albert Einstein. Albert Einstein was just as much of a genius as Stephen Hawking. Finally! The real action! The verbs! Comparing things with verbs is actually quite easy. You usually just add “more than” to the sentence. He speaks more than he listens. She’s played guitar by far the most. She’s played guitar the most by a long shot / by a long way. Give me three differences between Elon Musk and a cat. Hi Mr. Clark. Mr. Elon Musk is considerably bigger than his cat. He’s also richer than it. And finally, he’s probably going to live longer than his damn cat. My cat sleeps as much as me or my cat sleeps as much as mine? The first example makes more sense!